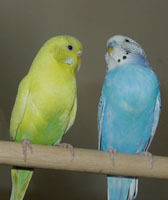 These two little cuties (Sprite is the yellow one) were really an attempt to give Shriek the cockatiel some company. He wasn't very impressed, and although they probably would have been okay together, everyone was more relaxed if they got their own homes, and Shriek is happier with a new person who spends a lot of time paying attention to him. So, these happy little guys chirp-n-twitter musically for most of the day. 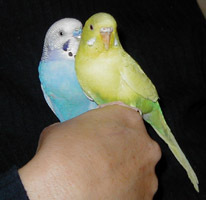 Budgies have a really remarkable amount of personality, for being such tiny birds! Frosty used to sing all day, and even tucked his head under his wing and sang himself to sleep. We've noticed that Sprite has become more vocal since Frosty died in 2007.